A few days ago, I wrote about how Kobo had launched its first e-book publishing platform - Writing Life -one that may eventually come to rival Amazon's Kindle Direct Publishing. I was excited and eager to get my books up on the site as I love to see my books sales in 'real' time and not have to wait until Smashwords decides to report them. So, how have I been getting on? The answer to this would be 'slowly.' It turns out my tried and trusted formatting for Smashwords doesn't work so well for the epub conversion on Kobo. Or at least it does... for some books... not so much for others. And considering all the books have been formatted in exactly the same way, I've no idea why this is! So, I've been playing around with different formatting, using 'Heading 1' to create an automatic TOC, but again, in some books this is working fine, in others it isn't! I'm sure the formatting experts around won't be struggling with this at all, but I'm finding it a bit of a head-ache. Secondly, I'm finding the actual publishing process (that is, the time I've hit the publish button to when it actually appears on the site) to be very slow. Two of the books I already had published on Kobo (the Serenity series) and had removed by Smashwords, went up quickly, but a new book, which I published on Thursday, is still not showing on the site. 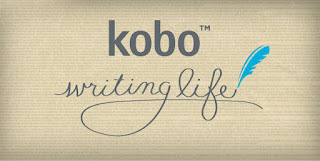 One final negative, before I start on the good stuff, is the lack of categories Kobo has available to choose from. For romance - which is the biggest genre out there - they only have four categories, and one of those isn't paranormal romance! Considering this is the second category in which I would normally place my vampire series (after Contemporary Fantasy) this leaves me in a bit of a quandary. However, on a positive note, apart from the conversion issues (which are more due to my lack of knowledge than any fault of Kobo's) the upload process is pretty simple. And - the best part! - you are able to download the epub file to use as you wish, which is fantastic. I also like the ability to over-ride the automatic conversion price to either round up or round down in Hong Kong, and Australian, and New Zealand Dollars, among other currencies. But here is the big thing, so far, sales have been (drum roll please) a big fat Zero! Now I admit I've only got a couple of books up so it isn't really a fair comparison, but considering my sales on Amazon, B&N, and Apple are easily enough for me to support my family on, not having sold anything yet is a little disappointing. However, I'm planning on looking at this long term. Kobo are only just starting to build their own sales platform. If they're going to be the next big thing in self-publishing, I plan to be right there beside them!